Common law marriage in Pennsylvania | Pittsburgh Family Law Services, P.C. November 8, 2013 · by Pittsburgh Family Law Services, P.C. Beginning in early 2005, marriage under the common law in Pennsylvania was abolished prospectively, and all marrying couples must marry under the provisions of the Pennsylvania Domestic Relations Code by obtaining a marriage license from their county of residence. What is the “common law” in Pennsylvania? The “common law” of Pennsylvania is nothing more than a recognition by the court system that people have done certain things in certain ways for long enough that they have become part of the rules of our society, even though our state legislature never made formal laws about them. The Pennsylvania court system recognizes, defines and enforces the common law (which is established by precedent) and can make changes to it as necessary over time to reflect changes in common practice and in society. The Pennsylvania legislature can override the common law by passing a law concerning the same thing, just as it did by abolishing new marriage under the common law from 2005 onward. How is common law marriage different from other kinds of marriage in Pennsylvania? Once the marriage occurs, no matter how it occurs, there is no difference at all. You sometimes hear people talking about somebody’s “common law wife” or “common law husband” as if that is something sleazy or low-class, or as if that is something different from a “real” marriage, but the fact of the matter is that marriage is marriage, no matter how you got there. As a divorce lawyer in Pittsburgh I prefer to use the term “marriage under the common law” to “common law marriage” to make that clear. How did people get “common law married” in Pennsylvania before 2005? People became married under the common law of Pennsylvania when they exchanged words of “present intent” to marry before the beginning of 2005, with or without anything about the marriage put in writing. No marriage license or officiant was needed to get married under Pennsylvania common law. If each member of a couple who could legally marry said to the other, “I take you now for my spouse” (or words to that effect) before a witness, that was sufficient to create their marriage. You could have a wedding ceremony. You could go to a Notary Public to sign a document declaring yourselves married to each other. However it was done, it needed to be a clear and affirmative act of taking each other in marriage, just like entering into any other contract. Am I married under Pennsylvania common law? A simple test. When people tell me that they were married under the common law of Pennsylvania, the very first question I ask them is, “When did you get married?” Almost every single time, the answer I get is something like, “We didn’t get married, we’re common law married,” or “We’re married because we lived together more than seven years,” or “We had kids together.” No good. The fact is that people who were married under the common law in Pennsylvania have a wedding anniversary date just like couples who marry with a marriage license. A client once asked me, “We filed our taxes together as “married.” Doesn’t that make us married?” I had to explain that this did not make him married, it just meant that he might be committing tax fraud. You could not marry by accident under the common law. You could not get married by mistake, or by assuming that you must be married by now, because you have been together for so much time. You could not get married without you and your spouse-to-be clearly stating your respective present intents to marry on the same occasion. A valid common law marriage is as legitimate and as valid a marriage in Pennsylvania as is a statutory marriage. A court will presume that a couple is not married under the common law unless there is sufficient proof to the contrary and the supposed marriage took place prior to 2005. Such proof can include having filed joint tax returns, wearing wedding rings, and introducing yourselves in public as husband and wife. However, it is important to realize that doing these things did not create the marriage, but merely serve as proof that the “magic words” were indeed spoken on a particular date. Living together for a certain number of years would not create a marriage, even if the couple had children together. No words, no marriage… no matter how “married” the couple may have behaved. Under Pennsylvania’s common law you didn’t become married, you got married, just like anybody with a marriage license. Some bad news for a good woman. I once spoke with a woman who had been in a relationship with a man for more than twenty years. She had lived with him, had children with him, and stayed home to raise them while her partner earned the household money and accumulated a pension. After her partner decided to end their relationship she called me, told me she was married under the common law of Pennsylvania, and wanted to know what kind of spousal support and property division she was entitled to from the Allegheny County Family Court. I asked my usual question: “When did you get married?” She said that they never did, but told me about her understanding that two people living together and raising a family together was enough to be “common law married.” I had to give her the very bad news that she was not married, and that she had no rights to the economic benefits of marriage without having gone through the small-but-essential formality of getting married. Did existing Pennsylvania common law marriages become invalid in 2005? Any marriage made under the common law of Pennsylvania prior to 2005 remains valid, and will be legally recognized in a Pennsylvania family court. Why was common law marriage abolished in Pennsylvania? Common law marriage has caused far more problems than it has solved. Marriage under the common law is widely misunderstood, and the existence of most common law marriages is difficult to prove (which can cause trouble if the couple separates, or if one of the spouses becomes severely ill or dies without a will). Unmarried people sometimes encounter trouble – and sometimes, disaster – because of a false understanding that they have the economic protections and rights of being married because they are “common law married,” without ever having done what they had to do to become married under Pennsylvania’s common law. When you get a marriage license before you marry, you are creating a public record that makes it easy for anyone to verify the existence your marriage. It is now so simple for a marrying couple to get their license to marry, that common law marriage no longer serves a useful enough purpose to justify the problems it brings. Because of this I might never again have to tell a woman, who for two decades sacrificed everything to her relationship and her family, that the doors to family court are closed to her. I might not have to tell a man that he has to choose between fighting his employer’s benefits department over the cost of medical benefits he obtained for his former partner whom he thought (falsely) was his common-law-wife, or instead fighting his former partner’s claims for alimony and property division on the grounds that they are not married and never were. That would be nice. I don’t just say goodbye to common law marriage, I say good riddance. I live in Pennsylvania as part of a common law marriage from before 2005. How can my spouse and I protect ourselves? NOTICE: This document affirms a legal relationship. You are advised to seek legal counsel before signing it. By signing below we, ________________________ and ________________________, hereby affirm that on the ______ day of _______________________, ____________, we exchanged words of present intent to marry in [city or town] ___________________________, [county] __________________________ County, Pennsylvania, each of us then being both unmarried and legally eligible to marry, and thereby we became husband and wife on that date by operation of the common law of the State of Pennsylvania. Each of us affirms that our marital relationship is not being asserted herein solely for the purpose of participation in benefit programs. By signing below, we each verify this statement subject to the penalties of 18 Pa.C.S.A. Section 4904 relating to unsworn falsification to authorities, which provides for criminal penalties for the making of knowingly false statements. Sworn and subscribed to before me this ______ day of __________________, 20____. It is always a good idea to create at least two “originals” so that each of you has one. Keep your copy in a secure location. Please note that using the above statement does not create a lawyer/client relationship between us, that I make no guarantee that the above-proposed statement will be honored by any particular governmental body, court, business or individual, and that by using it you are assuming the sole risk of any and all consequences arising from the use thereof. Is there common law divorce in Pennsylvania? There is no “common law divorce” in Pennsylvania. There never was. Members of separating couples who married under the common law of Pennsylvania and now seek to have their marriage dissolved have to file a formal divorce action with the Pennsylvania Court of Common Pleas, just like spouses in any other marriage. If you need legal assistance with your divorce or family law matter in Southwestern Pennsylvania, call our family law practice to set up a personal consultation with a Pittsburgh divorce attorney. Please do not comment anonymously, and do not post anything that you consider confidential. We try to be responsive to commentary and questions, but know that posting here will not create an attorney/client relationship and that we will not offer legal advice via the Internet. My common law spouse and I.are splitting. I need council. If you’re local to my office you’re welcome to call us, but meanwhile I suggest that you give some thought to whether you actually were married under Pennsylvania common law. For that to be true, you must have: gotten married in Pennsylvania before 2005; and on the day you married, exchanged words of “present intent” to marry. You should give thought to what documentary proof you have of the existence of your marriage such as “married filing jointly” Federal Income Tax Returns, an application from one of you to put the other on his/her medical insurance as a spouse, etc. 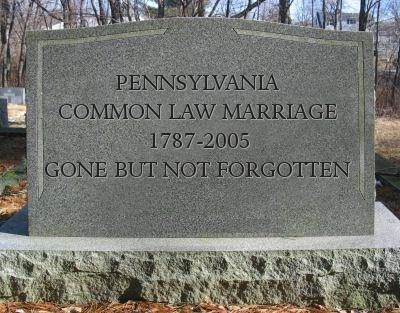 Marriage is marriage in Pennsylvania, no matter how you got there, and there is no “common law divorce” in Pennsylvania. That means that once you are able to establish the validity of your marriage under the common law, you step into the same process as any other divorcing couple.